Welcome to the Turbo Blu-Ray/DVD Giveaway! Fasten your seatbelts everyone you’re going on one fun filled ride because here is a fun movie the whole family will love as I know mine did! You will love the adorable garden snail who by the chance of a freak accident gets to go for his dream of winning the Indy 500! 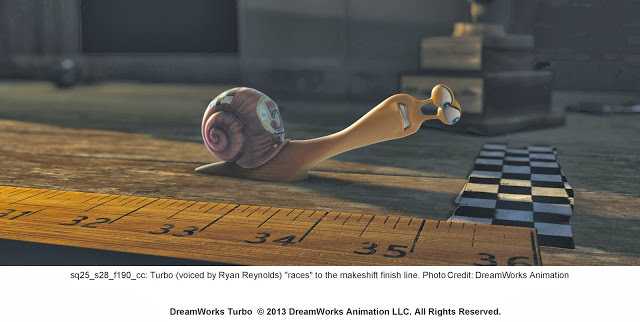 This snail is of course Turbo and you like me and my family will find yourself laughing and rooting for this adorable and courageous character. There are of course other endearing characters in the movie such as Turbo’s older yet careful brother Chet who tends to have some embarassing moments. Turbo just wants out of the slow lane and into the fast lane which we all know has it’s advantages and disadvantages. We don’t want to spoil the movie for you as you are going to want to watch and and thankfully it was just released this week on November 12th on blu-ray. So even if you don’t win you can still get this awesome movie to watch at home! You will be rooting for this amazing underdog! Fun Snail Facts – did you know? Salt is a snail’s biggest enemy! In the film, Chet falls down the stadium and just barely makes it through the center of a pretzel! He was so relieved he didn’t touch it, because salt can kill a snail, so they have to be careful! It would take a snail 2 hours to move from one side of a football field to the other. That’s 50 yards per hour. If you ran your fastest, it would only take about 20 seconds! Some snails can be as big as 12 inches. Can you imagine a snail the size of a ruler? Garden snails have thousands of teeth, located on their tongue! Snails do not have ears, but they sure can smell! That is how they find their fruits and veggies to eat. Snails can live to be up to 20 years old! Snails are nocturnal, that means they sleep during the day and get their work done at night and in the morning. No wonder Turbo could stay up all night watching Racecar videos! A garden snail can have as many as 430 baby snails in a year! Garden snails hibernate in their shells during the winter, and some hibernate during the summer too. When a snail moves, it leaves behind a trail of liquid slime. This mucus protects them from the hard surfaces underneath them. Snails are able to hang onto walls and move upside down thanks to this slime! Here are some of our favorite lines from the movie! Enter for your chance to win this fun movie which comes in a blu-ray/dvd pack! I would like to watch frozen, free bird, turbo, planes. The croods, wreck it ralph, cloudy with a chance of meatballs, hotel transylvania, the little mermaid, labyrinth and we’re going to see cloudy with a chance of meatballs 2 this weekend. We love all the Shrek’s in our house, the kids always laugh at donkey! Our favorite movie is disney’s sleeping beauty. We’re behind in our movie watching….so prob Monsters U and Despicable Me 2….and Turbo. Ice Age and Shrek movies are always a family hit. Tangled is a favourite as is Brave! Tangled, cars, cars 2, finding nemo, bolt, rise of the guardians, and a few others. I’m looking forward to Frozen. I also saw Despicable Me 2 recently and loved it. We want to see Free Birds and Disney’s Frozen. 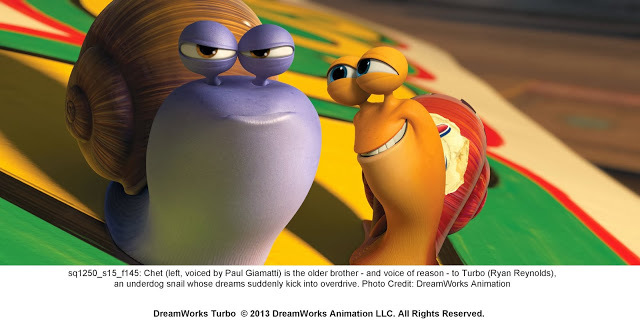 My kids have enjoyed all the Disney/Pixar and Dreamworks movie, Turbo is one of their favorites this year. Plus Planes, Epic, they are super excited for How To Train Your Dragon 2. We are looking forward to see Thor2. We love all of the Disney movies. We just saw Free Birds in the movies- it was cute. my niece and nephew love the classics like Little Mermaid and The Lion King. We still haven’t seen Planes yet, but now we really want to see Free Birds and I can’t wait for the Mary Poppins movie! Toy Story and Nemo have always been our favorites here on the weekend. I love watching all the Disney and Dream works movies with my grandchildren. I especially like Lightning McQueen as did my grandson. This is his favorite. He has yet to see Planes though. I would love to win this one for him I’m sure he would love it. I have 8 grandchildren and I so enjoy watching these movies with them. Cars movie-just gotta love mater. and smurfs 2 was hilarious. We loved Tangled, The Incredibles, and we want to see Free Birds. we enjoy despicable me so much and also monsters vs aliens. We are looking forward to seeing Frozen. We nearly always enjoy Disney movies, so we are looking forward to seeing ‘Frozen’ soon…I am a big fan of animated family movies. We just saw Monsters U and we’re going to see Free Birds today! we have loved mosters inc and the toy story movies. I loved watching Monsters University with the kids. Monsters Inc and Toy Story are favourites! We love all kinds of movies, especially Disney! we want to see Frozen. we also enjoyed cars, finding nemo and many others. I have to say some great family movies are Nemo, Toy Story, and Wreck it Ralph! All the early Disney movies are good too…The Little Mermaid, Aladdin, Beauty and the Beast,The Lion King, etc. We want to see Frozen! The Croods, Planes, and any Pixar Disney movie. The last one we enjoyed together was Wreck It Ralph. We love all of the Winnie the Pooh movies, and all of the Veggie Tale movies. I like all of the Disney Movies, and the Pixar Movies. Cars and Brave were really cute. Cars & Monsters, Inc. are my 2 favs to watch with the grandkids. can NOT wait to see the new pic Frozen! Looks so cute. I thought Cars was a cute movie. We love Monsters Inc. and Hocus Pocus. We are looking forward to seeing, Planes, Turbo and Frozen! we love 101 Dalmations & BH Chihuahuas we like dog movies round here & snail movies TOO!!! We like all kinds of Disney movies. We like watching The Smurfs, Despicable Me, and really any animated movies like those! We saw Free Birds last weekend and loved it. I am also looking forward to seeing Frozen. We like Brave and The Princess and the Frog. … I Would Like To See – FROZEN – It Sounds Great !!! I want to see Frozen when it comes out in theaters. We really enjoyed Jack the Giant Slayer! The movie that we are loving right now is Monsters University! the last family movie we watched was monsters university but we love the movie cars as well. Thanks for the chance to be a part if this giveaway!!! My 2 little boys love watching finding Nemo and also mickey mouse movies and the movie they really want to watch is Turbo. We like “Jingle All The Way” and “The Christmas Story” during the holidays. My nephews & niece and I love watching Finding Nemo & Bolt!